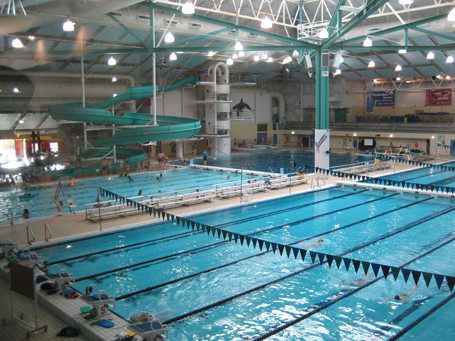 The Saanich Commonwealth Place was designed as both a community center for the City of Saanich and an aquatic venue for the 1994 Commonwealth Games, commissioned by the Victoria Commonwealth Games Society. It has now become one of the city’s main attractions. The leisure area with waterslide, wave pool, swirl pool, waterspray, and a “West Coast” theme, including waterfalls, tree ropes, totems, and poolside café . The centerpiece of the leisure pool is showcased by a shipwrecked red, white, and blue galleon. The boat dumps water over swimmers from a crow’s nest and shoots water from cannons, strategically placed on all sides. In addition to the aquatic components, the building also houses a library, restaurant, multi-purpose rooms, gymnasium, aerobics and weight lifting studios.